Do your preconceived ideas determine your next trip? "I have never, anywhere, encountered such friendly, sincere, helpful and warm people." "The apprehension and uncertainty I felt before departure were quickly dispelled upon arrival. I felt completely safe throughout the trip. " "It was one of the real highlights of a life full of travel experiences." Can you guess where in the world these comments from our past travelers are referring? China? Turkey? Perhaps Myanmar? Would you believe that they are comments from ElderTrekkers who recently visited Iran? Yes that same Islamic Republic of Iran; the one country that is always making news headlines for all the wrong reasons. Why would you go there when there are so many other safer places to visit you may ask yourself? “They treat women so poorly, they are all terrorists”. Have you ever asked those who tell you it is dangerous if they have ever been there? Chances are they have not and they have gleaned their information from various media outlets. They could not be more wrong. Iran is a safe and friendly country with so much to offer for those who are willing to go. It is precisely because no one goes there (or at least only small numbers of travelers versus other destinations) that add to its overall appeal. Iran is a country with a long and rich history dating back over 2500 years with evidence of this past on display everywhere. And best of all you can get right up close and personal. Rock carvings from 1000BC stand alongside the tomb of Darius the Great in Naqsh-e-Rustam while the greatest glory of Iranian past – Persepolis is mere kilometers away and where you can walk right up to exquisite carvings in marble and tile dating from the 5th century BC that depict animals, flowers and the king’s ancient armies. Travel to Isfahan and marvel at Naghsh-e Jahan Square, reportedly one of the largest in the world with its outstanding collection of Iranian and Islamic architecture. The desert city of Yazd sits like a turquoise gem in the middle of the harsh desert offering a glimpse into its Zoroastrian past. The Iranian people are proud of their country and its rich history and welcome visitors with open arms. Having led many tours to Iran I enjoy watching the transformation take place with those in my groups. They arrive unsure and weary and within a matter of days are wandering through the markets sharing stories or perhaps a cup of tea with the local people and wondering how they ever questioned coming to such an amazing country. Wearing a scarf on your head becomes less onerous than one would expect, especially when each day brings a marvel of sights to savour and experience. Our world is changing rapidly. One of the benefits to travelers who are willing to visit countries considered “off limits” means not only having the place to yourself (I rarely if ever encounter any other tourists) but sharing in the amazing experiences that travelling offers us as we interact with those in other parts of the world. It is an affirmation that we are not that different from one another and probably have more in common that we realize. Iran is an amazing country and one of my favourite destinations to visit. After you visit Iran you will still encounter those at home who will think you were crazy to have gone but at least this time you will be able to tell them firsthand how wrong they are in their opinion. David Roth, ElderTreks Social Media Manager and Tour Leader was recently in Rwanda to trek with the mountain gorillas. This is the second of a 2-part article on his experience. Climbing up a slope I am getting body-slapped by large thorn trees. The ground is muddy and loose and a few times I can feel my feet slip as I take a step forward. Grabbing at slippery vines and branches I decide to concentrate on the back of the person in front of me. Soon enough we reach a clearing on the ground and come upon a large segment of the gorilla group. It is mostly young gorillas and a female or two carefully overseeing them. We stand transfixed as one and my immediate fears abate somewhat as we observe them playing with each other. Two young males fight and roll amongst each other in an attempt to establish dominance. A lone female lies prone on the ground resting, or rather scratching, at a hard-to-find itch. Along with their grunts and snorts I hear another strange sound. It takes me a moment to decipher it. It is the thumping on gorilla-chest with their hands. Pock, pock, pock. Many of the gorillas take turns showing off this unique form of communication. I am momentarily stunned for I honestly thought the chest banging was something created for a Tarzan movie. A bit later our guide asks us if we want to continue on to find the male silverback and we all readily agree. Trekking upwards along the slope we soon find the dominant male sitting at the base of some bamboo trees. And true to form he has a large silver patch across his back. We were told in our pre-trek briefing that male gorillas take on the distinctive silver marking around the age of 12, after which it is difficult to get an accurate idea of their age. Compared to the other gorillas we have seen this day the silverback is huge. Placid estimates around 240 kilos. We stand mesmerized as the silverback peels back a large piece of bamboo seemingly oblivious to the whereabouts of the others in his group. I decide to move around to try and get a closer view of him. Sliding down a slope I am trying not to lose my balance and remain silent in my actions at the same time. I know I have failed miserably as my hand reaches out to arrest my fall and branches crack all around me. Despite my clumsy attempt at discretion the silverback remains seated working on his piece of bamboo. He has obviously deemed me a non-threat. I crouch down low to take a few photos. Suddenly he gives a start, gets up and starts running deeper into the forest. Our guide points to the canopy above and indicates that the silverback was startled by the sound of an aircraft flying overhead. As he leaves so do the other gorillas, instinctively picking up their cue through the thick rain forest foliage to follow. I want to get up and run in the other direction but as I rise I can hear Placid call out in a soft but firm voice, “don’t move!” I practically lean into the sharp thorns, clenching inwardly as one gorilla after another runs or leaps past me. I quickly come to recognize the strong sweet/sour aroma that surrounds the gorillas as they pass. I am so close I can reach out and touch them. Placid has now moved close to me making his own imitation gorilla grunts. We are later told it is the guide’s way of communicating with the gorillas and to let them know that there is no danger. And just as quickly the gorillas are gone and we are all alone in the forest once more. It is about this time that I suddenly recall the warnings about fire ants and begin moving my feet up and down while I stand in one place, all in the hopes of thwarting an attack. Surely my guide won’t see this as a further violation of his ‘do not move’ command. I breathe a sigh of relief when the order to continue trekking is given. We need only a few minutes before we locate the group again. They have settled in a small clearing that is even more contained under the heavy rainforest canopy. I glance at my watch willing time to stand still. To further add to my anxiousness I have not gotten a clear frontal photo of the silverback. Every time I move around to get a shot it’s as if he can sense what I am trying to do and shifts his large body around. Before I know it Placid quietly announces that it is time to leave the forest. Our time is up. I can hear a few grunts and groans from my fellow group members as they turn and depart one by one. Suddenly I realize that I am the only one left. I turn and can see that one of the guards is waiting for me at the trailhead. I pause and look at the silverback one last time, just as the sunlight appears through the trees illuminating his face. I marvel at the pure beauty of it all and wonder what would compel other humans to threaten the mountain gorilla’s existence. I also question my earlier sense of panic for I now feel calm, almost serene. Just then the gorilla turns his head and looks directly into my eyes. I can feel myself nodding as I thank him for allowing me briefly into his world. I say goodbye and head back down the trail. David Roth, ElderTreks Social Media Manager and Tour Leader was recently in Rwanda to trek with the mountain gorillas. This is the first of a 2-part article on his experience. “When we enter the park you can take only a jacket and your camera. Leave all other essential items with the porters. This is not a zoo. These are wild animals in their natural habitat. Anything can happen. Also, you may wish to tuck in your pants to avoid the sting of fire ants,” says our guide Placid. I glance at the seven others in my group to see if anyone else has any last-minute doubts as to what we are about to embark upon. They all look more confident than I suddenly feel. Then I notice that they are all wearing gaiters over their pants and the tops of their boots. I quickly fold my pants and pull my socks up as high as they will go. 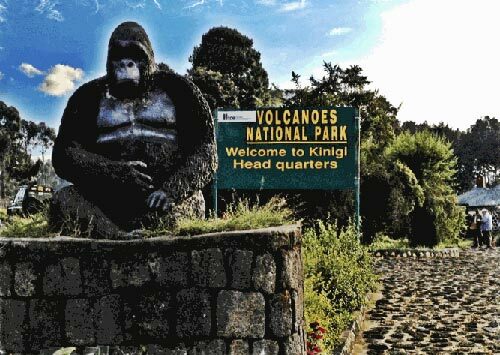 One hour earlier we had entered the Volcanoes National Park in Rwanda where I had finally arrived to fulfill a dream of trekking to see the famed mountain gorillas. The Volcanoes National Park is the name for the Rwandan section of the mountains straddling Uganda and the Democratic Republic of Congo. It is Congo, which uses the name I am more familiar with: Virunga National Park. We were met at the Park Ranger Station early that morning with hot coffee and tea as a local tribal group officially welcomed us with song, dance and drumming. They finished the performance with a cry of “you are welcome here” as the sun rose over the mountains behind them. Moments later we split up into small groups where we were introduced to our guides and briefed on the trek. “We have been assigned the trek to find the gorillas in the group known as ‘Agashya’. It is a group of 26 gorillas with countless babies, young and females and only one silverback male. You are very lucky today as this is a special group,” says a smiling Placid. What quickly follows is an almost violent 30-minute drive to the head of the trail where we meet our porters and guards. It looks like an entire village has come out to assist us on our adventure. The guards are easy to identify, as they are all carrying automatic weapons. I decide that the toughest-looking guard is the lone female. I can’t help but wonder what the weapons would be needed for. Each of us is told to assign our bag to a porter and I choose the tallest person to carry my tiny daypack. I feel slightly embarrassed as I hand him my light load. I hope he realizes that I am hiring his services more to support the local community rather than because I don’t have the strength to carry my own bag. Waving goodbye to our drivers, we set off on foot, one long column marching across soft farmers fields as we make our way to the base of the mountains. As we set out the sun is shining strong, however I know that the clouds and rain are a mere hour or so away from descending upon us. I find myself walking up front with one of the guide/trackers and willing the group to make haste. After only 30 minutes we arrive at a stone wall. A new guard peers his head over the wall from the other side with a walkie-talkie in his hand. Placid quickly emerges at the front of our line and after a brief conversation turns to face our group. “The gorillas are near. Very near!” I can see smiling and eager faces all around. “First we must climb this wall to enter the forest”, he announces further. We all line up to take our turn at scaling the wall. Helpful hands are offered and one by one we climb up and over. Soon enough it is my turn. Climbing the wall I hop down on the other side and find myself suddenly standing in the forest. A guard herds the few of us who have climbed over to a small clearing. Suddenly I hear a rustle in the leaves and quickly turn only to see two purple/black hairy backs race by. I need a moment to realize that they are the gorillas I have come in search of. I didn’t expect to find them so fast. I am not ready; it is too soon, I almost shout out loud to no one in particular. It is with an unusual feeling of both exhilaration and fear that I stand in the jungle path watching the gorillas run and leap in the air through the trees around us. What do you do when the realization hits that something you have always dreamed of doing may actually be quite terrifying? Part of me wants to hop back over the wall while the other half, heart beating strong, wants to follow. The decision is made for me when the rest of our group makes it over the wall and we are herded into a tighter circle. Placid steps forward and motioning with his hand waves us on. And then just like that the sunlight disappears as we enter deeper into the forest.